As a child, I remember making faces every time any Karela dish was served! As an adult, I relish it! So, what happened…did I start making it the way I wanted to eat it or was it just the fact that I started appreciating the uniqueness of Bitter Gourd or Bitter Melon (the name and the flavor)? Whatever the case may be, Karelas now have a special place in my heart (and my stomach)! 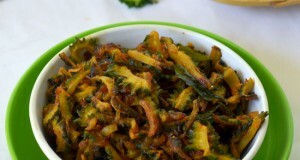 Finely chop the Karela, preferably in a food processor. Sprinkle Salt generously, mix well and set aside for 30 minutes. After 30 minutes, take the Karela in your palms and squeeze the juice out of it. Set aside and meanwhile heat a skillet on medium heat. Pour in the Oil and once hot, add in the Mustard Seeds and allow them to pop. 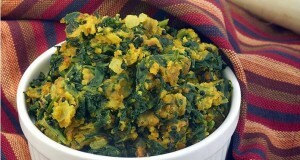 Add in the Fenugreek Seeds and cook for 15 seconds. Add in the Sesame Seeds and allow them to pop. Add in the crushed Peanuts and cook till they turn light golden in color. Add in the squeezed Karela, mix well. Also, add in the powdered spices – Red Chili, Coriander, Cumin & Turmeric. Mix well and cover and cook till the Karela is cooked. Once the Karela is cooked all the way through, remove the cover and allow it to dry out and turn crispy. Add in the Lime/Lemon juice and mix well. Cook it to desired crispy-ness. 1. Be very careful while the Sesame Seeds are popping. Keep a lid handy. 2. To save time use roasted peanuts instead of raw ones. 3. Dry Mango Powder is a great alternative to Lime or Lemon Juice. 4. 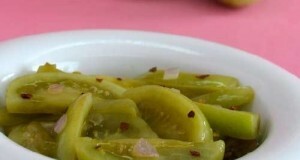 We have used Chinese Karela for their mild flavor but Indian Karelas may also be used for this dish. 5. 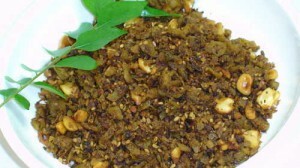 Karela Chutney has a long shelf life and can be stored in the fridge for upto 7-10 days.